A Popular Beautifying Destination in Melbourne offering Proficient Manicure and Pedicure services. It is very essential to keep your hands clean and your feet neat! The pedicure and manicure sessions are not extravagant fun investments. You not only feel confident about yourself, but raise the hygiene bar of your lifestyle! We recommend that at least once in a month, treat your feet and hands with some refreshing and revitalizing manicure and pedicure sessions. Maintain a healthy and younger looking skin not only on your face, but also on your hands and feet! Come over to our beauty salon with your friends and family and let us offer you the best pedicure and manicure sessions! Easy to make an appointment by calling us at 0431 128 834 or filling up our contact form online. People looking for apt beautifying solutions living in Melbourne and its suburbs have chosen us as the favored hotspot for satiating all their beautifying and skincare needs. 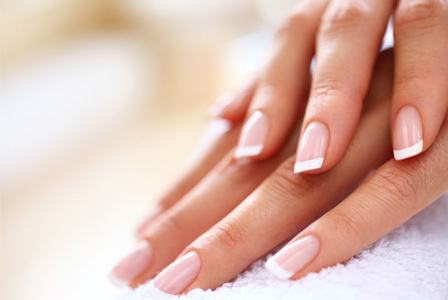 Pamper your nimble fingers like never before with our high-quality manicure services. From clipping and shaping of your nails to a gentle hand massage, your hands get moisturized and hydrated. Cuticles refinish and a nail polish of your choice brings to an end the elaborate process. Do you want to groom your nails so that you can do away with fragile tips and splits? Our trained beauty experts at Naaz Beauty Salon take genteel care while exfoliating your hand and nails so that you have neatly groomed nails and soft, supple hands. The antioxidants used in the exfoliating process will protect your skin from sun damage and pollution. Let your well-groomed hands make you more confident. Our beauty therapists know how to wrap you up in oodles of comfort so that you can just relax in the manicure sessions. Your hands flaunt a young and a refreshing look at the end of the session! Choose the shape you want your nails to exhibit and we will be happy to offer you proficient manicure sessions. Does the mechanical grind of daily life make you to crave for a relaxing pedicure session? We treat your tired feet, relieving the aches and knots with a blend of sea salts that softly pampers your feet. Our trained beauty therapists infuse you with a rejuvenating feel that relieves your feet from soreness, leaving the skin soft and supple. The spa pedicure treatment that we offer with the top-notch Australian products satisfies our clients. A good pedicure session involving foot massage that you enjoy helps in increasing the blood circulation, reducing stress and fatigue, leaving your skin replenished. Clipping and trimming of the nails, cleansing the cuticle and application of the nail polish at the end of the session is the perfect add-on to the exhilarating spa pedicure session. We are happy to serve our clients spread all across Melbourne and its suburbs like Bayswater, Ringwood, Ferntree Gully, Oakleigh, Chadstone, Box Hill, Blackburn, Glen Waverley, Boronia to name a few. Call us on 0431 128 834 to make an appointment. Henna also known as Tatto design in Forest Hill is a must visit for your next special weeding or party occasion. Call us today to enquire further.